Keeping a WordPress security and activity audit log is a good practise, but it is useless unless you can automatically search through it to find specific WordPress changes and user actions. We are happy to announce another premium add-on for WP Security Audit Log plugin; Search and Filtering Add-On . This add-on allows you to do free text based searches in the WordPress security audit log. It also contains filters which you can use in conjunction with free text based searches to easily track down a specific WordPress change or user activity in the audit log. The WordPress security audit log of busy multi user and multisite WordPress websites typically contains thousands of WordPress security alerts, thus making it impossible to find a specific WordPress change or user activity manually. Hence why we developed the Search and Filtering Add-On; to allow you to search through the WordPress security audit log easily and automatically. Do you need to find all the changes that have been done to a specific WordPress blog post, page or custom post type? Or you need to find out when a specific WordPress plugin or theme was installed, updated or activated, or which WordPress user did it? With the Search and Filtering Add-On there is no need to browse through the WordPress security audit log manually. Simply enter the post’s or plugin’s name in the Search and hit the Search button to find all the WordPress security alerts that match your text search. For example in the below screenshot I am searching for WP Security Audit Log which is both a plugin name and a WordPress page title on our website. In fact in the results there are WordPress security alerts about both the page and the plugin. 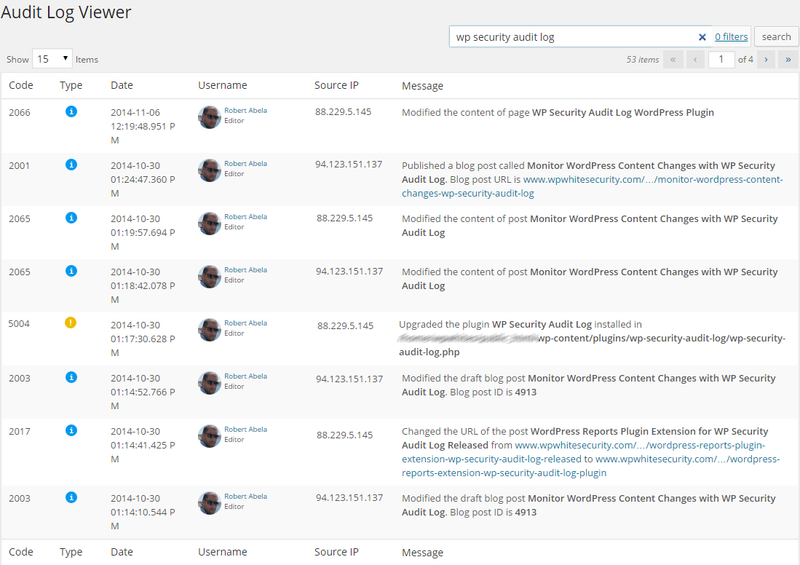 You can also use the built in filters to fine tune your WordPress security audit log searches. For example if you search for a specific plugin there might be several users who have done a change related to that plugin thus a good number of alerts will show up. In such cases you can use the filters to filter the search results by a specific user, date range, Alert ID and also source IP Address. To apply a filter simply click on the filters link and specify the filter in the relative input field. Filters also have an auto complete thus are very easy to use. For example in the below screenshot you can see that when I typed 1 in the IP address filter, the auto complete shows all the IP Addresses that are stored in the database and that their first digit is 1. When you pay for a WP Security Audit Log add-on you do not just pay for the add-on itself, but also for one year of premium support. If you have any issues with any of the add-ons you can simply drop us an email on support@wpwhitesecurity.com and we will provide you direct support. From time to time we release add-ons updates which include new features and functionality. Apart from that we also frequently release updates which improve the existing functionality of the plugin or make bug fixes to address specific issues. Therefore when you pay for a WP Security Audit Log add-on you will be entitled to update your add-onwith the latest updates to have a more stable and efficient plugin. For more information and to buy the Search and Filtering add-on for WP Security Audit Log visit the Search and Filtering Add-On product page. 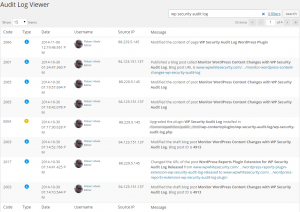 Keep track of everything that is happening on your WordPress and WordPress Multisite with WP Security Audit Log plugin. By knowing everything that is happening on your WordPress you ensure both the security of your blogs and websites and the productivity of all your users. If you have been using WP Security Audit Log and it helped you improve the security of your WordPress and WordPress multisite please rate it on the WordPress plugins repository.